This table is brought to you by the Harvard foosball table manufacturer. This table is on the low-end of the tables they make, but does include some nice features and parts. 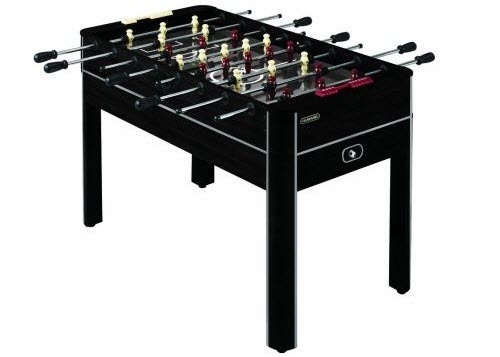 The two best features on this black deca table are the counter-balanced foosball men and the adjustable leg levelers. The counter-balanced foosball men make it easy for your men to stay at a horizontal position when you aren't holding the rod in order to play 1-1 games where 2 rods are untouched. The adjustable leg levelers make it easy to level your foosball table. This foosball table is priced around $280 US.